Last weekend we were not able to send out an update due to the fact that we were without internet access. 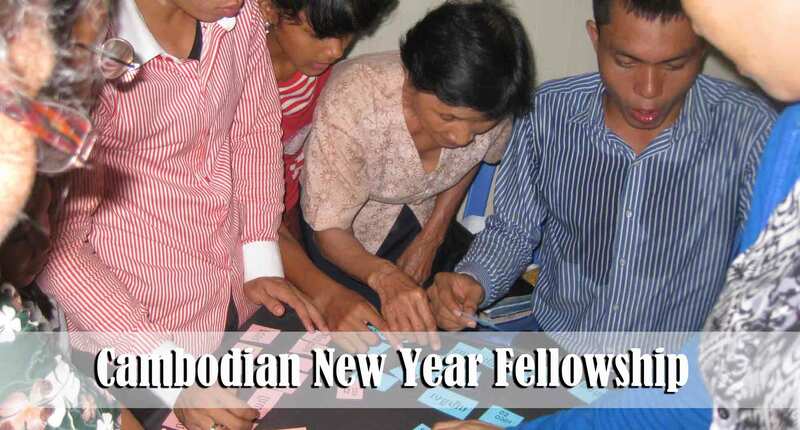 Two weeks ago we had a great time, as a church, fellowshipping together during the Cambodian New Year week. We played several games together, watched a Christian film in the Khmer language, and had a light dinner. Here in this photo you see some of the people playing a Bible verse game. They had to put the words in the correct order in order to form the verse without knowing what verse it was. Several tables competed against each other and they enjoyed the challenge. When we started the church we made the decision to “begin with the end in mind.” I knew that the Lord desired a church full of people who are committed not just to “attend church” but who desired to be fully committed disciples of Jesus Christ. From the very first Sunday we taught and stressed the importance of obeying the Lord out of gratitude for what He has done in our lives. Therefore, we encouraged people, once they were saved, to become fully involved in the services, prayer meetings, and soul-winning ministries of the new church. In my judgment church-planters often make a mistake by starting out a new church-plant with, for example, only Sunday morning services with the idea that they will gradually add a Sunday evening service, Wednesday evening service, and organized church wide soul-winning. Obviously, as a church grows and expands there will always be new ministries added and taken away but we believe that it is best for someone to be fully involved from the very moment they are saved. It’s often very difficult to move someone to commitment once they have been complacently sitting in a church for month upon month. If commitment to Christ and His church is the goal, then commitment ought to be modeled, taught, and expected from the beginning. This philosophy is Biblical, but it is counter-cultural here in Cambodia. Because of the passivity that is stressed in Buddhism, people are looked down on and persecuted when they are considered to be “too involved” or to “believe too much.” We thank the Lord that the new believers here have the faith and conviction to go against their culture in so many areas. Today was “Missions Sunday” at our church here in Phnom Penh. Though the church is only two years old and most of the folks are new believers, they have seen their responsibility as a Christian to be involved in the Great Commission and world missions. The nationals are currently helping to support three different national missionaries who are serving here in southeast Asia. 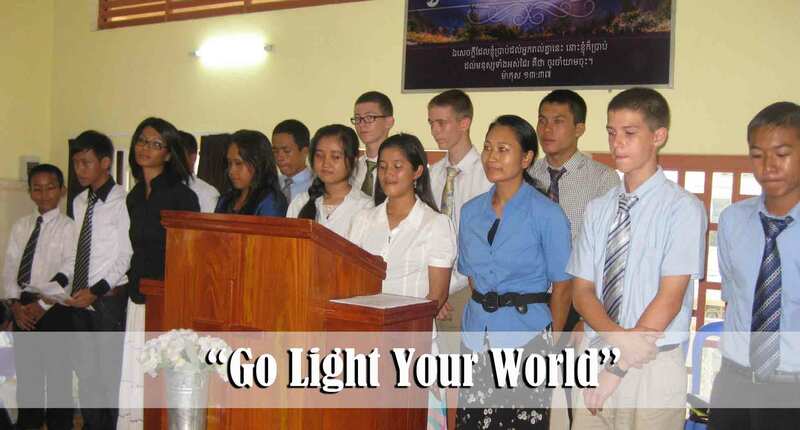 One missionary family, Jeremiah and Esther Khun, are Burmese nationals who are serving as missionaries in Myanmar. They are serving in a very difficult part of the world that is controlled almost totally by Buddhism and the occult. The second missionary family, S——, are Cambodian nationals who are faithfully serving in a “creative access” country near here. They do not have the freedom to gather believers or do public evangelism. Therefore their evangelism and church services must be held underground. 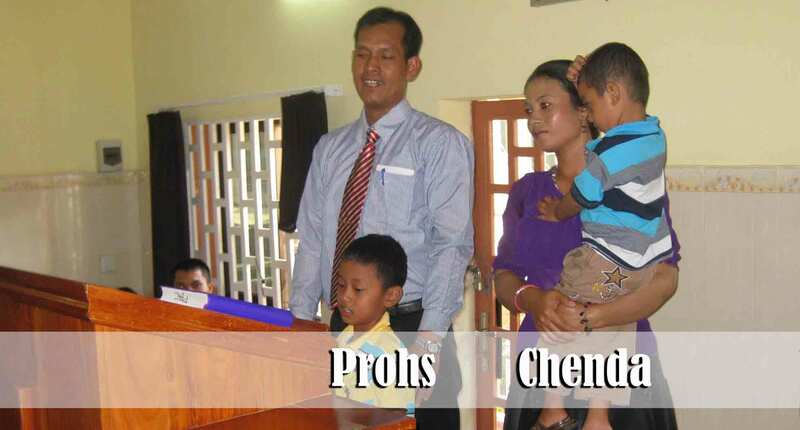 The third family, Proh and Chenda, are Cambodian nationals who are faithfully serving the Lord as home missionaries right here in Cambodia. They were both saved as young people at New Hope Baptist Church which was started and led by Missionary Rodney Ruppel. We were privileged to have this family join with us for our first service this morning. Prohs preached a great message dealing with the Christian’s responsibility to share the Gospel with the lost. I particularly wanted Prohs and Chenda to come because of their strong testimony as believers. They have a family that is honoring to Christ and I wanted their example to be seen and felt in the church. 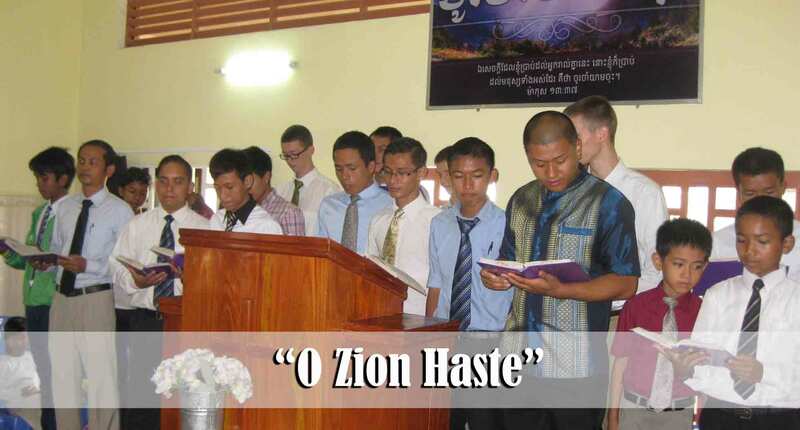 Our church is thrilled to be able to have a small part in their ministries in Ta K’mou, Kampot, and Ta Keo province. As we’ve been considering the mandate of the Great Commission this past week and, in particular, Acts 1:8, I have stressed the importance of not just reaching out to other countries with the Gospel through world-wide missions but also reaching our “Jerusalem, Judea and Samaria.” The folks here are very faithful is handing out tracts and soul-winning. In the past two years we have printed thousands of tracts. I prepared a special graphic to help the church visualize the impact that the Lord is allowing us to make not just in our Jerusalem (Phnom Penh) but also to our Judea. Every day of the week with the exception of Friday, we have groups from the church leave Phnom Penh and travel to the various locations indicated on the map. They go for the purpose of soul-winning as well as teaching new believers who have been won to the Lord over the past year or so. Arrow # 1 represents our church here in Phnom Penh. It is the “home base.” Arrow # 2 is approximately 37 miles from Phnom Penh and takes two hours one way to get there. Arrow # 3 is approximately 36 miles from Phnom Penh and takes about two hours one way to get there as well. Arrow # 4 is approximately 8 miles from Phnom Penh and takes about 30 minutes one way to get there. Although, they are currently working on the road and it has taken us up to an hour and a half to arrive there in recent days. Arrow # 5 is approximately 37 miles from Phnom Penh and I believe it takes about one and a half hours one way to get there. (I have not been to this outreach as of yet.) Arrow # 6 is about 15 miles from Phnom Penh and takes about an hour and a half one way to get there (including a ride on the ferry across the river). 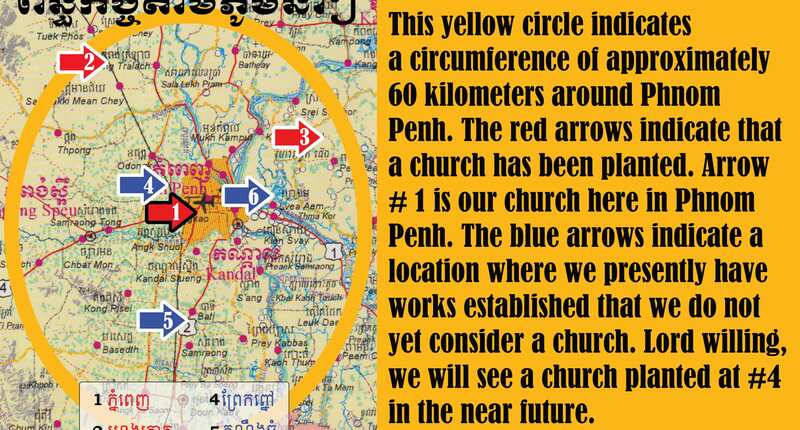 There are literally hundreds of villages within the yellow circle that are still without any Gospel witness whatsoever let alone a doctrinally sound church of any kind. As we have more national leaders trained we hope to be able to impact many of these villages. Please pray for more laborers ! Another focus of the services this morning was for us to be reminded of the power of the Gospel as it is shared with the lost by God’s people. We had four adults share testimonies of how they were saved as a direct result of the personal soul-winning efforts of the folks who are part of Pacific Baptist Church of Phnom Penh. 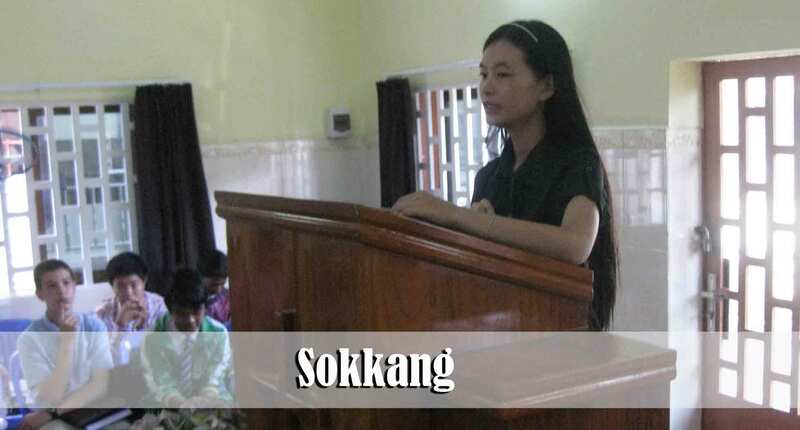 Sokkang lives just about two minutes from the church and was saved this past year. She shared of the change that God has made in her own life and the life of her husband since they have known the Lord. She admitted that prior to being saved she lived for gambling, was not a good wife and mother, and had no purpose in life. Now that she is saved she has a desire to honor Christ with her life as well as be the wife and mother that God desires her to be. She encouraged our church to not forget about the people who live in our own neighborhood. They need Jesus too! 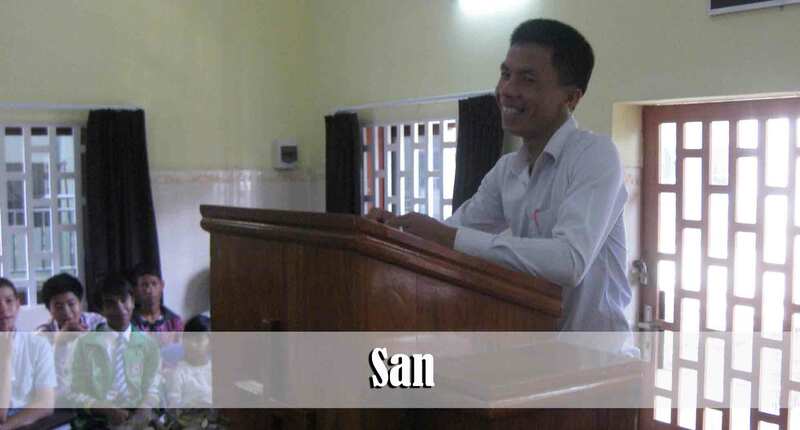 San shared a testimony about the importance of having soul-winning missionaries here in Cambodia. The Lord allowed me to lead San to the Lord back in 2006. Since then he has had his spiritual ups and downs but for the past nearly two years he and his wife have been very faithful examples of what it means to stand for the Lord under heavy persecution. San and his wife, Yom, have both been disinherited by their unsaved parents and life has not been easy for them over the past year. Their faith was tested several months ago as their newborn baby died in their arms just 10 minutes after being born. Thankfully they are still faithful to the Lord and to serving others. San is a faithful soul-winner in the village church. (Arrow # 2) Today he stressed the importance of being a good testimony for the Lord within your own family. Sovann lives in the village next to arrow # 2. Though he is Cambodian he is fluent in Mandarin (Chinese) and works as a translator at a Chinese garment factory. He shared with the church that he is actually from the city but left the city to go live in the village when he was hired at the factory. He said that village life was very lonely for him and he was not accustomed to living the village lifestyle. It was through the kindness of one of the families in the village church that he was first introduced to the Gospel. 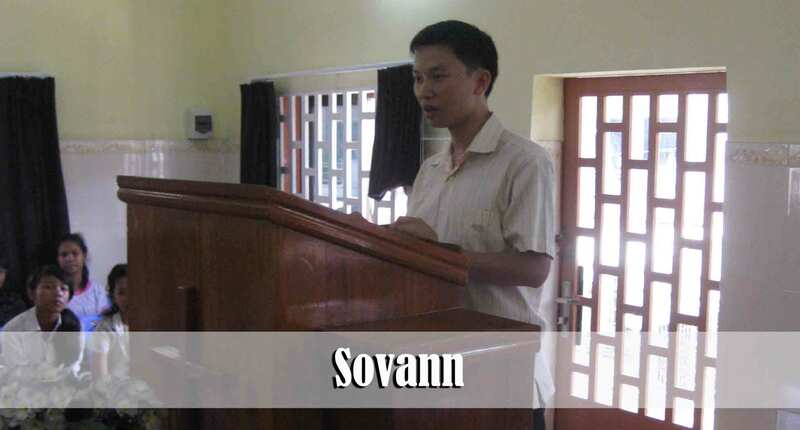 Sovann has been saved now for 5 weeks and has a strong desire to know the Lord. Please pray that his wife’s heart will be opened to the Gospel and that she will be saved. Sovann is very evidently a natural leader and I am confident that as he grows in the Lord he will be used in a mighty way to influence folks for the cause of Christ. Today he stressed the importance of our Phnom Penh church continuing to travel to the villages to win folks to Christ. I want you to know Bundit. He is 15 years old and originally began attending our Children’s Ministry nearly two years ago. At that time he lived just about two blocks from the church. He used to be quite intimidated of those in his neighborhood who knew that he was a Christian. In fact, I distinctly remember that he would hide his Bible at the church because he was afraid to bring it home for fear of what his parents would say. He would often come ring the door bell on Monday and ask if he could get his Bible because he wanted to read it. Over the past year or so he has grown in his faith and boldness. His family all knows of his commitment to the Lord but he is no longer intimidated by their comments to him. A couple of months ago his family moved to the edge of town just past the Phnom Penh airport. He could no longer walk to church but he was committed to attending anyway. He now rides his bike through the heavy traffic for 30-40 minutes in order to get to church. We are so encouraged by his desire to be at church every time that the doors are opened. Debbie recently began teaching him how to play the piano. It seems that he has some natural talent and I know that he is excited to think that one day he will be able to play for church. 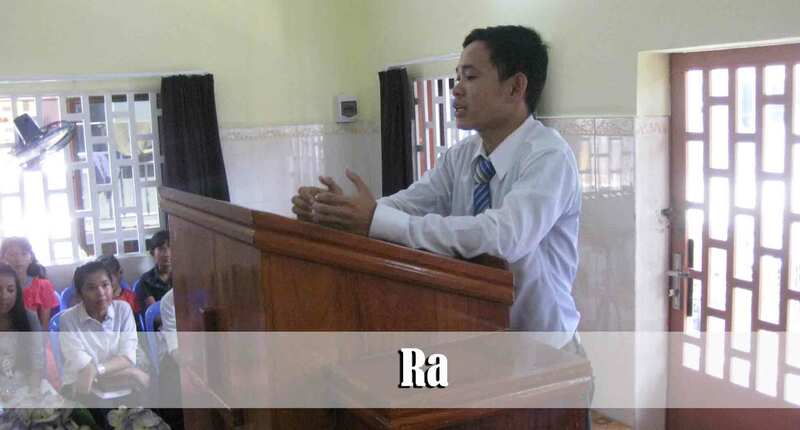 Please pray for Bundit to remain faithful to the Lord. 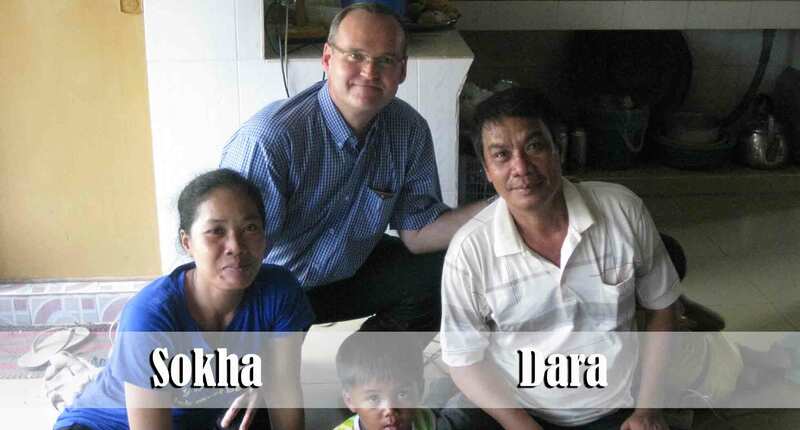 We have been reaching out to Sokha and Dara for over a year now but have not seen them respond positively to the Gospel. Last week I visited them in their home and had the opportunity to eat lunch with them. They told me they were so happy that we could be friends because they like talking to me. I told them that I actually was not content to be their friend if that was all that they were interested in. I have never used that statement before with someone that I’m trying to lead to Christ and don’t necessarily recommend that anyone else uses it either. However, this past Saturday morning just before our Faithfulness Rally (Saturday visitation and soul-winners meeting) Sokha called me on the phone and asked if I was coming to see them or not. I told her that I was leaving for the village just after the meeting and I would not be back to Phnom Penh for several hours. She then asked if it would be okay for her and Dara to go with me. I told her that about 20 of us were going to the village to share the Gospel and encourage new believers and that she would likely either find it boring or might even resent the things we were going to be doing. She assured me that her and Dara actually wanted to be with us and insisted that they really wanted to go soul-winning with us. So we picked them up and they went ! They both had several hours to hear the Gospel presented over and over. I am hoping that their actions are an indication that they are responding to the conviction of the Holy Spirit. Perhaps they are trying to just “feel us out” and make sure we aren’t some type of cult or crazy people… good luck on that one 🙂 When I dropped them off at their home around 1:00 p.m. Sokha had a huge smile on her face and said that they both had a great time. Dara works nights as a security guard and sleeps during the day. He only has a small window of free time where I can actually meet with him. Please pray that we will have some productive meetings in the very near future and that Dara and Sokha will be saved soon. God continues to work in the hearts of folks in Prak Pnou village. (arrow # 4) Each Tuesday and Saturday myself, Brother Has, and several others go there to teach and share the Gospel. The Lord allowed me to lead Vuthy to Christ nearly a year and a half ago. His wife, PhanNy, was led to Christ by Mrs. Has just about three months ago. We currently use their house as a meeting place to hold an evangelistic Bible study each Tuesday. We have been witnessing to Chouen for about three months now. As I have dealt with her in her home about her need of salvation she will often complain that when she comes to church or listens to us talk she immediately gets a headache and becomes dizzy and unable to concentrate on what is being taught. It is very common here for those who are not saved to get headaches while they are listening to the Gospel message. In fact I told her that it was the Devil who was oppressing her and making it difficult for her to concentrate on what she was being taught. Two weeks ago she confided to one of our Cambodian soul-winners that she very often has a “kruu” that possess her. A kruu is a demon. It is likely a familiar spirit that has been passed down to her from her ancestors. The kruu is supposedly looked to and depended upon as the need arises. This is not a rare thing here in Cambodia. We see it quite often. Just three weeks ago, prior to her admission that she is involved with demons, myself, Brother Sinath, Sovann, and Hem all experienced paranormal activity while witnessing to her in her living room. She continues to desire to attend the Tuesday Bible study and will often attend the Sunday morning service in Phnom Penh as well. 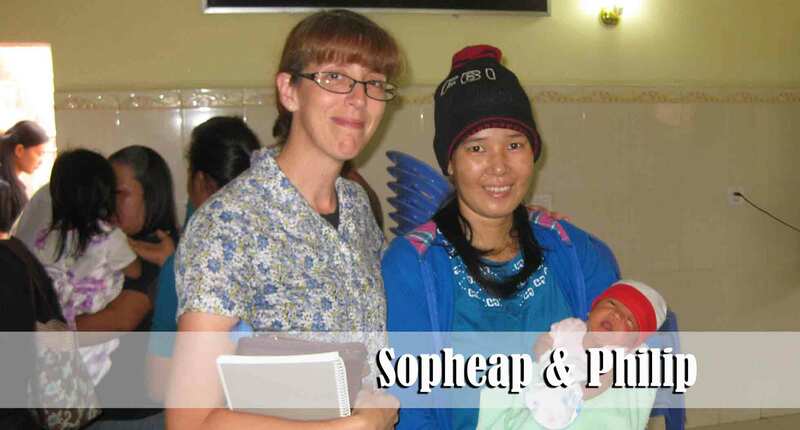 Please pray that the power of the enemy will be bound in Chouen’s life and that she will turn to Jesus as her personal Saviour. 2 Corinthians 4:3-4 is as true today as it was when the Apostle Paul was led by the Holy Spirit to pen these words nearly 2,000 years ago: But if our gospel be hid, it is hid to them that are lost: In whom the god of this world hath blinded the minds of them which believe not, lest the light of the glorious gospel of Christ, who is the image of God, should shine unto them. We have several more prospects in Prak Pnou village with whom we are working. Please pray for their salvation as well: 1) Grandpa Cheng, 2) Mr. Somat & Ry, 3) Mr. Leng & his wife, 4) Mrs. Sophat and her daughter, Srey Mao, 5) Miss Jrub, 6) Mr. Sophorn & Soka, 7) Mr. Veasna. Glory to God! What a blessing it is to read all the lives the Lord is using you to touch in Cambodia! Agreeing with you in prayer for the souls mentioned and for your safety and provision and His power! The video of Ra’s testimony was such a blessing as well. I hope your back is doing well and you’re taking the time to do your stretches! …regarding the stretches… well, I’m not being too faithful… I need to get with it 🙂 Thank you for your prayers!